First principles dictate knowing what the creatures in the genus Connochaetes are properly called. They have stubbornly defied attempts at a common name. The Dutch first established a "refreshment station" at the Cape of Good Hope in 1652, and were confronted with any number of animals not known to them. They call these bovids "wildebeest," wild beasts or wild cattle, as "bees" is Afrikaans for bullock or bovine. The English pronunciation of "wildebeest" is hesitant, occasionally following the Dutch with an initial [v] sound, though more often uttering the first letter as [w]. Swedish doctor Anders Sparrman, first writing in 1779 in his native tongue for the Royal Swedish Science Academy, and later in 1783 in English, contends that "t'Gnu is the Hottentot [Khoekhoe] name for a singular animal, which respect to its form, is between the horse and the ox." Sparrman's claims are repeated numerous times verbatim over the centuries, at least up until 1947 in the South African Journal of Science. English-language dictionaries (and Wikipedia) are in accord. There explanations are incorrect or at least incomplete, insofar as they do not explain the common pronunication [nu:] nor the hypercorrect and pseudo-British variant [nyu:]. Confusingly, the standard British pronunciation of "gnu" is (also) [nu:], the same way North Americans generally pronounce "new," though the standard British pronunciation of "new" is of course [nyu:]. It should come as no surprise that there is no consensus as to whether the wildebeest is kosher. It is no easy feat to recreate what "t'Gnu" might have sounded like to Sparrman, but some observations are in order. Khoekhoe is one of the so-called "click" languages, the sounds of which have been made known to audiences by Xhosa singer Miriam Makeba. Diacritic and punctuation marks, such as the apostrophe, have been used to denote these "clicks," though their use in Khoekhoe has been standardized only in recent years, and only with regard to a dialect spoken largely in Namibia. The "g" in "gnu" is pronounced in Dutch, by contrast with the general practice in English, but not in the same as the English consonant (that is, [g] as in "girl"). The Dutch and their Afrikaner descendants pronounce the "g" closer to the "ch" in the Scottish "loch" (rendering the word as [xnu:]). Somehow in the process, English would have had to have jettisoned the t + click + g sequence in "t'Gnu" to arrive at our current pronunciation, surely a lot of sounds to lose, which by turns survived in some fashion in Dutch (and Afrikaans). Simultaneously English would have had to have rejected the Afrikaans and Dutch pronunciations as inauthentic. All of this would suggest the current English pronunciations are in a sense "wrong." Some have in fact suggested, both in jest and seriously, that gnu should be pronounced [gnu:], including National Geographic and the Oxford Dictionaries. The assumption appears to be that the call of the wildebeest (said to be something close to "guh-nu") must be the source for the names of the animal in the indigenous languages of southern Africa. Yet there is no published evidence of a [g] sound for the gnu in any Khosian language, and indeed this would contradict the experience in Afrikaans where no [g] sound is heard regardless of how the beast sounds. There is hope for working this out: The Khoekhoe people may not be the source of the word in English. Though there are two species of gnus, and their range overlaps, the black wildebeest or white-tailed gnu lives the further south and east from the Cape of Good Hope. The blue wildebeest or brindled gnu (consisting of five subspecies: the eastern white-bearded, Cookson's, Nyassaland, western white-bearded and common wildebeest) range further west and north toward the Afrikaner stronghold at Capetown. In the language of the San people (formerly known as Bushmen) a "nu" is in fact a black wildebeest as recorded in a 1956 Bushman-English dictionary. Though the generic form "gnu" is also attested in the language, where "g" appears to represent a click sound (and not [g]), there is no form equivalent to "t'Gnu" nor anything else that might be easily blamed for the Dutch pronunciation [xnu:]. Douglas Harper's Online Etymology Dictionary (2010) uniquely gets right a "Southern Bushman" origin for gnu based on the form "!nu:." This is the best evidence for why [nu:] is widespread for gnu in English, and why this should unapologetically be the case. What is old is patently "nu" when it comes to the wildebeest in English, yet what is black is not blue. Given its date of publication, the gnu does not make an appearance in the Book of St. Albans (1486). No doubt Dame Berners would admit the general form "herd" for a group of wildebeest under the rubric "all manner of deer" (which at the time just meant animal in the broadest sense). An Internet search will uncover tens of thousands of hits for "herds" of animals in the genus Connochaetes, so called for the gnu's beard (kónnos in Greek) and flowing hair or mane (khaítē). Thus their adjectival form should by rights be "connochaetine." An "implausibility of gnus" or "wildebeest," though less common, will still result in tens of thousands of results. This is quite an achievement as James Lipton (yes, that James Lipton) created "implausibility of gnus" out of whole cloth in 1968 for his book An Exultation of Larks without explanation. Regardless there have been no fewer than 63 published works with the phrase to date. Whoop Studios produces a limited edition print entitled I — an Implausibility of Gnus. Jay Sacher opined in A Compendium of Collective Nouns (2013) that perhaps Lipton was contemplating the wildebeest "galloping en masse at speeds up to forty miles an hour, a vision of the prehistoric world come to life." It is also worth noting that the creature is called the "clown of the savannah" for its mating rituals. Connochaetine implausibilities moving at high speed are capable of injuring their main predator, the lion. Both sexes boast long, dangerous horns, so that the female gnu mimics the mating competitions of the male. The implausible abounds. All guests to Inside the Actors Studio are commended to ask James Lipton whence he came up with this unlikely but clever term of venery. 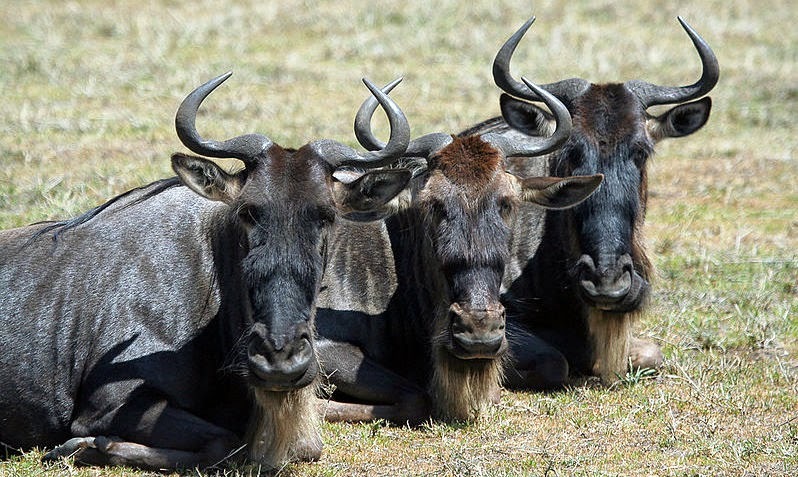 The Spanish plural is uncertain (though so is English: gnus, gnu), as both the forms ñúes or ñus are found. The pronunciation is unclear. Both [gnu] and [nyu] are conceivable. The initial pronunciation [ny] in Spanish and Catalan, and to some extent French, is puzzling, as it finds no basis in any of the Khosian languages nor in Dutch. It is possible that this is in imitation of the psuedo-British pronunciation [nyu:] sometimes heard in English. More likely, as the letter combination "gn" in Italian is pronounced [ny], these sister Romance languages followed suit. Note that neither Japanese nor Korean makes this mistake.